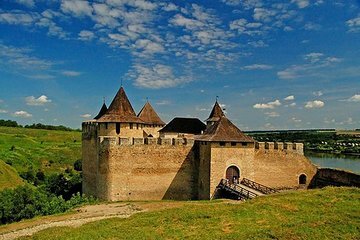 Immerse yourself in medieval history on this private 5-hour day trip to Khotyn Fortress. Round-trip transportation from Kam'yanets'-Podil's'kyi hotels and guest houses provided. Flexible morning departure time. Choose your departure time when booking (anytime between 9 a.m. and noon), then be ready for pickup in the lobby of your Kam'yanets'-Podil's'kyi accommodation. Settle in to your comfortable tour vehicle and enjoy the scenery on the 18-mile (30-km) journey. Explore the Khotyn Fortress, built in the 8th century and very well preserved. Take a guided tour of the fortress to learn about the battles, military leaders, scientists, and writers who spent time there. Get views of the Dniester River before stopping at the local restaurant for an optional lunch (own expense). Return to your accommodations for drop-off. This private tour ensures personalized attention and a flexible itinerary.